Number two in our series of Tutorials to get you started into Modding. Today our topic is textures. Compared to modeling, creating textures is rather simple and all good modding teams provide templates to get you started painting car designs. This is a rather autodidact approach, but a valuable nonetheless. Turns out there are very few dedicated tutorials for car painting. They all require some basic understanding of Photoshop. Get cracking and get experienced. Be flexible in your approach to painting. Before I repeat more platitudes, let’s get to some special skills that have a lot of potential and aren’t used very widely so far. 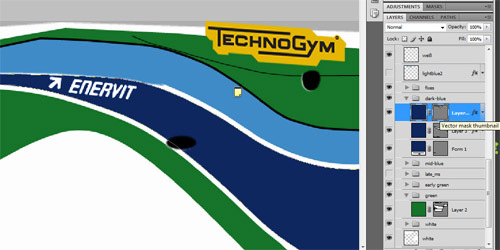 Textures are pixel-based with discrete width and heights, however Photoshop offers neat vector functionality. Instead of drawing lines, you can set up vector paths, that describe the areas and lines of the car design. Those lines are as smooth as can be and it’s very easy to change lines. With painted pixels scaling and distortion becomes very tedious and you lose a lot of quality. Instead, you can change the path and the affected area updates automatically. One of the difficulties of painting are the edges between mapping surfaces. These seems can become tedious, especially if you have a logo that goes right across such a seam. This seperates the skilled painter from the lazy one. The latter tries to work around those bits and rather puts the logo someplace else instead of positioning it correctly. The same can be applied on design lines. Using vectors helps tremendously as you can work more exact – and again, change lines without quality loss. Working with Vectors can be a bit messy in Photoshop and it takes some time to get used to it, admittedly. However, the benefits outweigh this by far. Imagine the situation the 2D artists had with the 2006 mod. 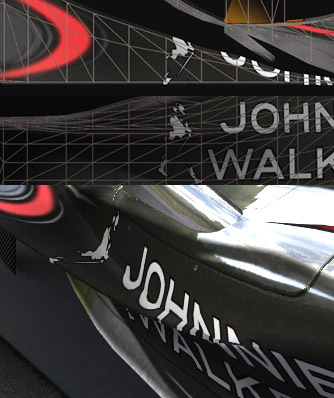 Each car had 3 textures, each had roughly 50 layers with all designs and logos for 10 track variants on average. The effort of saving each texture variant, each shader maps was quite large and it quickly becomes a boring, repetitious and error-prone process. For the 1994 mod, we will do it differently using a method we should have looked into a long time ago. This script switches defined layers on and off and specified states to files. The script is rather simple, the execution is still slow, but it far beets the manual work. In case of our Ligier, the result are 16 texture files in TGA format. Saving right to DDS does not work, as the nvidia plugins can not be used in the script. To convert all TGA files to DDS you can use Dropps, part of my DDS-Utils. This will convert all files in one batch based on the predefined settings. Scripting has been one major improvement of our workflow at CTDP. At last, some no-gos we suggest you never do. A difficult part about skinning a car is finding the right logos. And even more difficult: finding them in a suitable size and format. We have this problem very often working on F1 1994, especially with the smaller teams like Larrousse or Pacific. They had many sponsors, for which it is impossible to find proper logos on the internet. However, you should never ever resize a small logo to make it bigger. It will hurt the quality and leave you to ridicule. Something else to be concerned about are the alpha channels. Alpha layers determine the amount of reflection on a certain part of the texture. Generally, the alpha layer has the same mapping as the texture. Alpha channels are greyscale only and do not support colors. The general rule is: the darker an area on the alpha layer is, the less light does it reflect. So, black will cause no reflection at all; white will mean the biggest possible reflection and is in most cases completely useless. 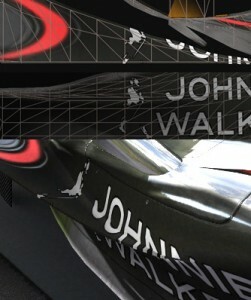 The more reflection you have, the less you will see ingame of your actual car livery. See also this tutorial teaching what’s up with alpha channels in rFactor. We take questions! If you are stuck with a problem or have questions related to modeling or textures ask them and we will adress them in a future post here on the blog. Concerning finding the right logos – you say to never upscale a logo to make it larger. If you have a logo that is too small and need it larger, will you go about re-drawing the logo itself in vectors, or do you use another method? Very good question, let me answer this in more detail in one of our next posts. The short answer is, that we try to get Vector logos from various sites. Often this is not possible and the last resort is redrawing them. Yeah we discussed trying render to texture painting, the biggest issue I see is, you have very few people skilled enough. If you have trouble finding new people, it is a bad decision to go for far-out spacey technology for which you can’t find people to use it. It also makes it difficult to have a common workflow within the team if only one is using it. Still, I think it has potential! Ok, here you go. Tried Google Docs for it, not familiar at all – hopefully it’s visible at your place, Daniel. Not visible from here (Italy), Koen. Did you set the document to public?